PSX Castlevania: Symphony of the Night (USA) "Replay Mode" in 12:44.25 by ForgoneMoose. Castlevania: Symphony of the Night is the first installment of the Castlevania series on PSX. Follow Dracula's son Alucard as he glitches through the castle on a quest to end his father's life. This run is played on a Replay save file (not newgame+ because neither experience nor items are carried over) using the Luck Mode command. Using Replay allows the player to skip most cutscenes and alters what the librarian can sell. Using Luck Mode lowers the player's base strength which, among other changes, ironically makes the run faster by enabling a route filled with kicking enemies that wouldn't be possible otherwise. A run that beats the game through save data corruption is available here. If you prefer the main character to have muscular bare arms and to pray to the rain gods to defeat bosses, you may enjoy the Richter version. If you want to see a run that beats every boss, see this run. We also have a run of the Saturn version using Maria. 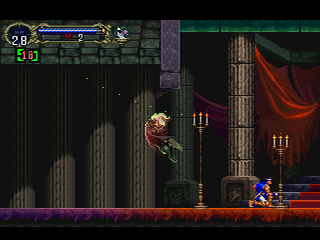 We even have a run where Alucard avoids killing everything except Dracula.